1. The roots are not easy to grow around. 2. Soil balls are small and easy to loose. 3. Transplantation is quick and easy and transplant season is prolonged. 4. Can reduce a number of costs. 5. Transplant survival rate and quality increased significantly. 6. Easy and quick operation. 1. Simply hang on hooks on the wall. 2. Add three quarters of nutrition soil and water retention agent. 3. Put seedlings in it. 4. Water the plants regularly. 1. Some buyers said the water drys out fast, The following methods may help. METHODS: placing the plants inside a plastic bag or lining the rows with plastic to help keep the water where you place it. This method is shared by a buyer, I am very grateful to him / her. 2. If the weather is very hot, please don't expose the planter in the sun when the plant is still in the seedling stage. 3. The material of the product is felt cloth. I must admit that this material is not waterproof, but it has a certain moisturizing effect, and the buyer can properly water the plants according to the local weather conditions. 4. If the buyer has any questions, I hope that you can contact our customer service first, we will try our best to solve your problem. 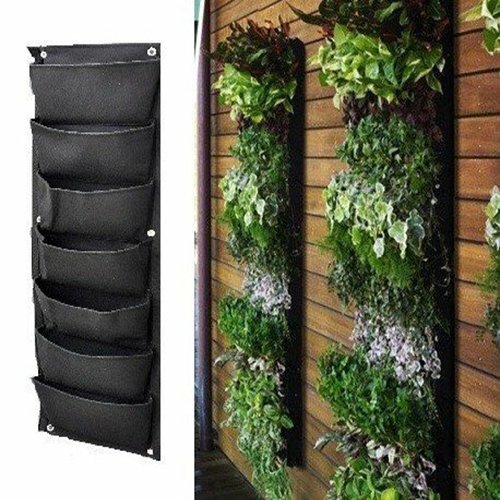 Material: Felt Cloth, 7-Pocket Wall Hanging Planter Balcony Garden Vertical Flower Vege Herbs Grow Bag. Features: rugged, self-absorbing, corrosion-resistant, breathable,Wall-mounted, save space for planting. Application Scene: Balcony Garden / Home Decor / Supermarket Wall / Cafe Decor / Garden Nursery. Suitable for planting flowers, vegetables, strawberries, hanging plants and so on. If you have any questions about this product by Meiwo, contact us by completing and submitting the form below. If you are looking for a specif part number, please include it with your message.